When it comes to prog I am partial to that of british origin. I cannot really explain why, more than that I think every nation has something of it's own tone. And that tone gives me something of an extra shivering sensation. Apart from being partial to the british side of prog, I have found myself to be very much in love with it's counterpart from eastern Europe. There is something peculiar and wondeful about the music created from behind that wall, as a matter of speaking. I will not drone about the difficulties, though they existed and certainly made their impact on the result. Rather i will simply state that for those of you who are about to discover or are in the process of doing so, you have an enormous treasure of progressive music ahead of you. It seems to me that there were two countries in eastern Europe responsible for some of the finest prog music of all time: Poland and Czech Republic. In particular that is the case in the Czech Republic. For me Modry Efekt stands as one of the greatest and most progressive (when it comes to evolve and explore the boundaries of music). 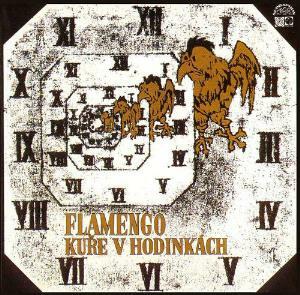 Flamengo originated from Prague and the connection to Modry Efect in terms of musicality is evident. Flamengo made one album back in 1972, apart from some singles. The music on this beautiful album is very much in line with other brass-rock of the period and influences can be heard. In particular I find a strong resemblance to Modry Efekts excursions into big band brass-rock with progressive leanings, cirka their Nova Synteza album. Their is a slightly more hard rock approach to Flamengos music and the presence of flute makes it personal and original, standing apart from the resemblance mentioned. The music is very vibrant, providing an almost live feel to it all. It is really kicking. The guitar and drums is very up front and impressive. In "Stále dál" the drumming is furious and the guitar is screaming, which is nice. The album as a whole seems cohesive and very focused, blending brass-rock with progressive music, resulting in a very impressive mix of styles. In part I hear Mogul Thrash, in parts Modry Efekt but it is very much Flamengo, spiced up with that eastern European flavor. That flavor is hard to describe but it is a sort of sad rage, moving mellowness and pride. I find this to be a very pleasant, excellent album. I wish the organ could have been more audible but that's coming from me, a certified organophile. All in all there is little you could wish for when listening to this album. In some respects it is a wonderfully perfect album but there are some minor flaws, albeit truly subjective flaws. There are some melody lines I sort of disagree with but that is all, I think. Musically the album is very tight, raw and hard rocking with great brass, great guitar and wonderfully alive drumming. The vocals are also dealt with the utmost delicacy. If you are looking for brass-rock or prog from the eastern European scene, look no further. Flamengo's album is a little gem waiting to be discovered.